The Frigidaire FFAD5033R1 50 Pint Dehumidifier is the medium capacity model in the newest range of dehumidifiers in the Frigidaire range. Although units of this size are generally less popular than their 70 pint equivalents enough have been purchased and reviewed to show that this unit is as well thought of by users as the larger model. With its Energy Star® qualification and ability to control humidity in areas of up to 800 square feet this unit is ideal for medium sized basements and other areas of your home where excess moisture is unwelcome. 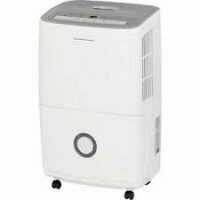 As with all portable dehumidifiers the FFAD5033R1works most effectively at comfortable room temperatures and will be much less satisfactory in a very cool basement. A large majority of users report high levels of satisfaction with the Frigidaire FFAD5033R1 and, in addition to its undoubted effectiveness find it easy on the eye and unobtrusive, due to its compact dimensions and relatively quiet operation. Given its capabilities, effectiveness and positive reception we are happy to recommend this model to our visitors. Adjustable Humidistat - In the same way as you would use a thermostat to set the temperature you wish your heating system to maintain a humidistat sets the level of humidity you need for your comfort and to preserve your home. 3 Speed Fan - Fans are noisy and, although a higher fan speed accelerates drying, the noise can be inconvenient or irritating at times. The option to select a lower fan speed reduces the impact of the noise and will be welcomed by many who find the noise of a dehumidifier bothersome. Automatic Defrost - Those who are familiar with dehumidifiers will know that ice forms on the cold coil even at typical room temperature. This ice or "frost" degrades performance and, if left, may damage your appliance. The appliance detects any build-up of ice and stops the compressor. The coil is no longer cooled and the flow of air from the fan melts the ice. This feature protects your unit and ensures that it functions at maximum efficiency. Auto Restart - This feature restarts your appliance following any interruption to your electricity supply. It ensures that if you are away from your home, or otherwise unaware that your unit has been stopped by the outage, that it restarts and continues to protect your home. Continuous Drainage Option -If you prefer not to have to empty the water container every time it fills you have the option to fit a length of hose to an outlet in the appliance and to let the water drain out as it is collected. This drainage is by gravity feed so it may only be used where you have a convenient outlet at floor level. Washable Antibacterial Filter - All dehumidifiers have an air filter to trap airborne particles. This protects the appliance from damage and ensures it operates at maximum effectiveness. The filter installed in the Frigidaire FFAD5033R1 is designed at trap some of the bacteria found in the atmosphere so also improves the health of the air. The filter must be cleaned about every two weeks and may safely be washed in accordance with the guidance given in the user's manual. Portability - The FFAD5033R1 weighs only 46 pounds and with its casters and carrying handle is easily moved about your home. User reviews of the Frigidaire FFAD5033R1 50 pint dehumidifier are quite plentiful and it is clear the most users are well satisfied with their purchase. It is apparent from many comments that this appliance is effective and controls humidity easily, provided it is used according to the directions found in the manual. Users like the modern appearance of this unit and the ease with which it may be moved around the home if required. Inevitably there are a few users whose experience has been marred by delivery of a faulty machine and who have been put to the inconvenience of having to seek and wait for a replacement but, as a proportion of the whole, this group is no larger than might be expected for this class of appliance. A large majority are very satisfied with their acquisition. The Frigidaire FFAD5033R1 50 Pint Dehumidifier is clearly a sound performer and, for its price, good value for money. As a new model from a well regarded manufacturer the FFAD5033R1 maintains Frigidaire's reputation as a supplier of one of the best dehumidifier ranges currently available. Inevitably there are some dissatisfied customers but fewer than may be found among users of less popular brands and no more than are reported for the other leading brands. Our conclusion is that the Frigidaire FFAD5033R1 is an effective product offered at a fair price and we are happy to recommend it any prospective purchaser.